The October 2017 issue of Hemmings Classic Car came in the mail today. It includes an article on an “Unbelievable Restoration of a 1979 Plymouth Horizon,” which certainly falls into my “Who Saves These Cars?” category. In honor of this, I’ve updated a blog entry on the 1980 Horizon from a few years ago. 1980 was the third model year for Chrysler’s “Omnirizon” front-wheel drive subcompact. Once again, the only available engine was a Volkswagen-sourced 1.7 liter/105 ci four-cylinder with a Holley two-barrel carburetor and all of 65 bhp. With the standard four-speed manual transmission, 0-60 came in about 14.5 seconds in the 2,135-pound car. Fuel economy was rated at 24 city/31 highway by the standards of the day, so the 13-gallon fuel tank gave a range of about 320 miles with a 10% fuel reserve. Standard exterior and mechanical equipment on the $5,526 car (about $18,500 in today’s dollars) included rack and pinion steering, front disc/rear drum brakes, a rear electric defroster, tinted glass, and P155/80R13 glass-belted radial tires (a size still available from Kumho). Standard interior equipment included a heater, an AM radio, and an electric clock. A variety of exterior and interior packages were available to dress up the rather spare base Horizon. The Custom exterior package ($101) added some bright moldings to the outside of the car. Moving up to the Premium exterior ($207) added some more bright moldings and deluxe wheel covers. The Premium Woodgrain exterior added (natch!) woodgrain appliques on the body sides and lower liftgate pane. The Custom ($112) interior added a glove box lock, a cigarette lighter, custom door panels, and custom vinyl seats. The top-of-the-line Premium ($355) interior added a color-keyed console, a “luxury” three-spoke steering wheel, premium door panels, and a reclining passenger-side seatback. 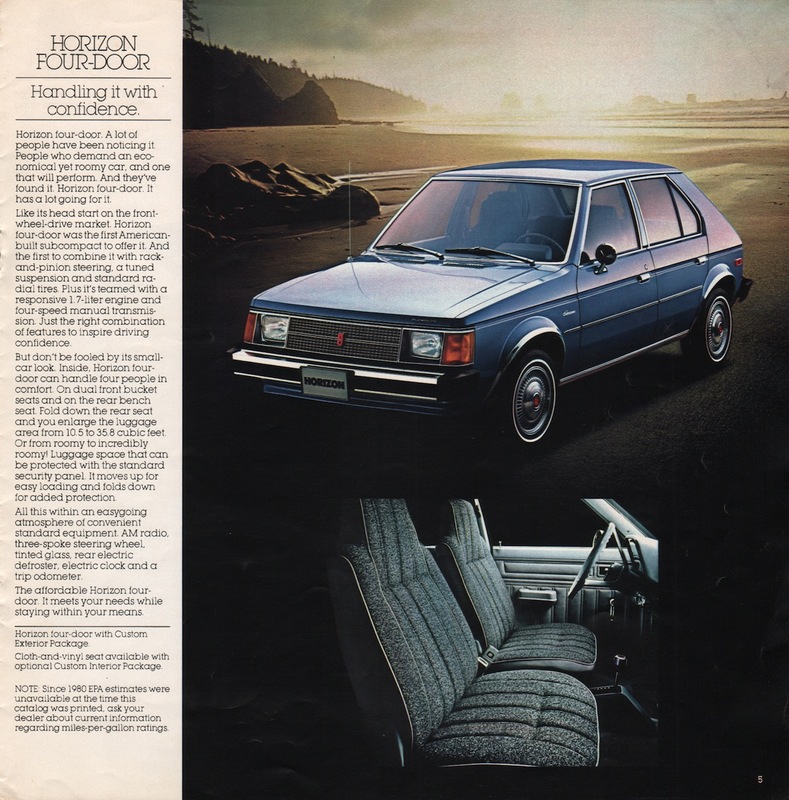 Exterior and mechanical options included a removable flip-up glass sun roof ($182), power steering ($161), power front brakes ($77), and a three-speed TorqueFlite automatic transmission ($340) that slowed the Horizon’s acceleration even more. Inside, air conditioning ($541), a sport steering wheel ($40), and an AM/FM stereo radio ($93) were available—there were no eight-tracks or cassettes available as factory stereos (it was left to Crutchfield and others to provide those upgrades—and they still do). 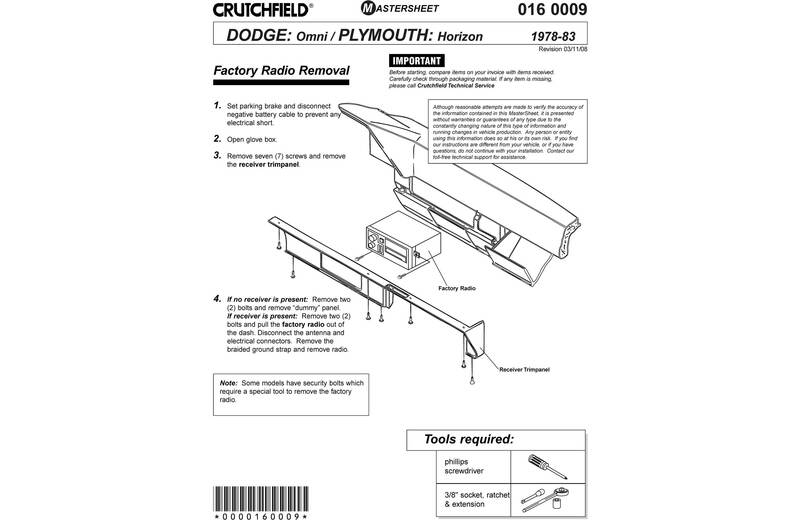 Page from 1980 Plymouth Horizon brochure, linked from the always useful PaintRef.com. The Horizon continued to sell reasonably well in the 1980 model year—almost 86,000 units. The slightly sportier two-door TC3 hatchback added another 60,000 or so units. Combined, the two models accounted for 58% of Plymouth’s dire 1980 automobile sales totals in the United States (Plymouth’s other offerings for that year included the Arrow, Champ, Gran Fury, Sapparo, and Volaré). A few folks are trying to save “Omnirizons”—including that fellow featured in Hemmings Classic Car (journalist Robert Suhr)—but you rarely see these cars for sale in either the Hemming’s Motor News classifieds or on eBay Motors. The exception is the later and much faster Dodge Omni GLH. Make mine Crimson Red Metallic, please. Thanks for reading the story about my Horizon!!! Thanks for commenting—I admire the effort that you put into restoring your 1979 Horizon and results that you achieved. As a faithful reader of Hemmings Classic Car, articles like these are among the ones I enjoy the most.